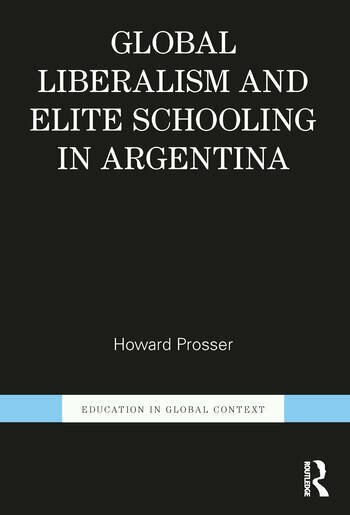 A response to Argentina’s shifting political climate, Global Liberalism and Elite Schooling in Argentina reveals how elite schooling encourages the hoarding of educational advantage and reinforces social inequalities. Presenting Buenos Aires’s Caledonian School as part of the growing scholarly discussion on elite education in the Global South, Howard Prosser situates the school’s history in concert with that of the state, the region, and the globe. The book applies new methodologies for the study of elite schools in globalizing circumstances by fusing ethnographic fieldwork with archival research and a wealth of secondary sources. This transdisciplinary approach focuses on the nature of liberalism as a global ideal, positing that eliteness is sustained by an economy with its own culture of value and exchange that, ironically, the scholarship on elites may help perpetuate. Howard Prosser is a lecturer in Education at Monash University, Australia. He holds a PhD in History from the University of Western Australia and a PhD in Education from Monash University. He co-edited In the Realm of the Senses: Social Aesthetics and the Sensory Dynamics of Privilege (2015).